This section describes how different branching strategies can be modeled in Octopus Deploy. Octopus doesn't care about branches. It cares about NuGet packages. Your build server cares about source code and branches, and uses them to compile and package your application. Octopus, on the other hand, only sees packages. It doesn't particularly care which branch they came from, or how they were built, or which source control system you used. The section below describes some common branching strategies, and what they mean in terms of NuGet packages and releases in Octopus. Channels don't do anything to help with this scenario, but we do discuss this scenario in the Channels Walkthrough as "standard release promotion". The simplest branching workflow is, of course, no branches - all developers work directly on trunk or master. For small projects with few developers, and when the project isn't really in "production" yet, this strategy can work well. 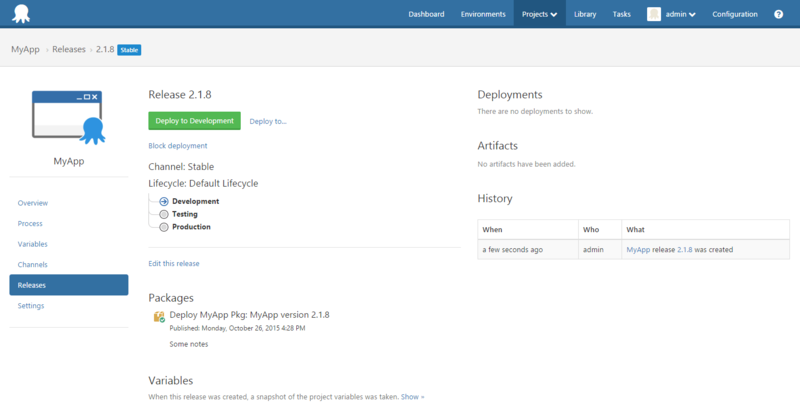 Builds from this single branch will produce a NuGet package, and that package goes into a release which is deployed by Octopus. Channels don't do anything to help with this scenario. Sometimes developers work on new features that aren't quite ready to ship, whilst also maintaining a current production release. Bugs can be fixed on the release branch, and deployed, without needing to also ship the half-baked features. 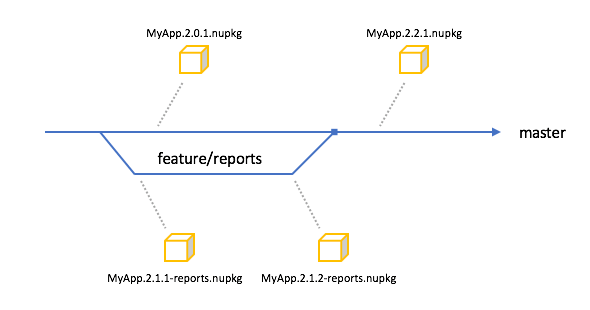 So long as one release branch never overlaps another, from an Octopus point of view, the process is similar to the "no branches" scenario above - new NuGet packages are built, and those packages go into a release, which is deployed. Octopus doesn't care that they came from a branch; to Octopus, there's just a stream of new, incrementing package versions. Channels can help with this strategy as discussed in the Channels Walkthrough: Supporting multiple versions. 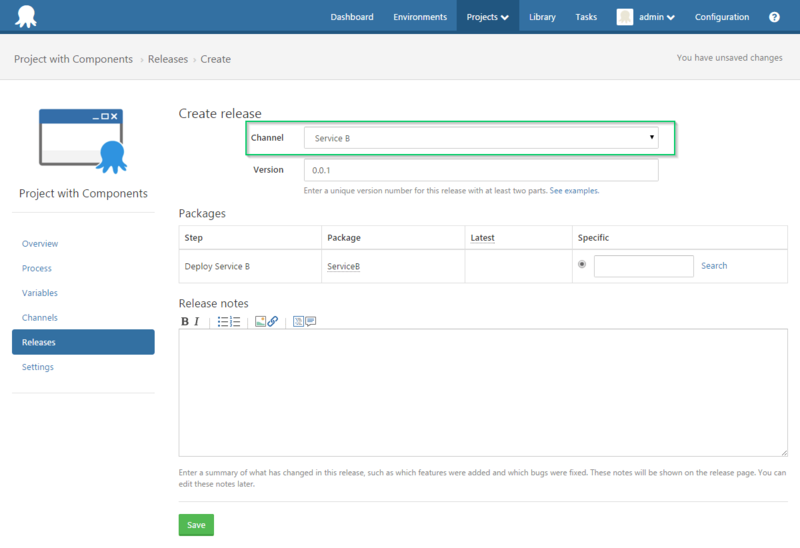 If your project has 5 packages, when you go to the Release creation page, it might show all 3.x versions of the packages when you want to make a 2.x version, since it sorts by version numbers. 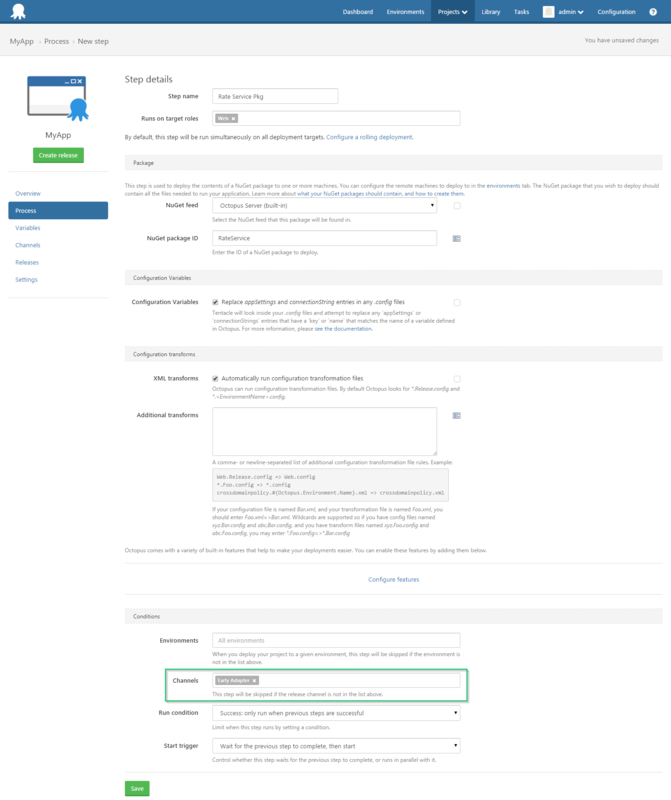 The original UserVoice suggestion for this feature was simply to make this page a little more user friendly. Multiple release branches may be supported over a period of time. For example, you may have customers who are using your 2.x versions of your software in production, and early adopters testing your 3.x versions while you work to make it stable. You'll need to fix bugs in the 2.x version as well as the 3.x version, and deploy them both. 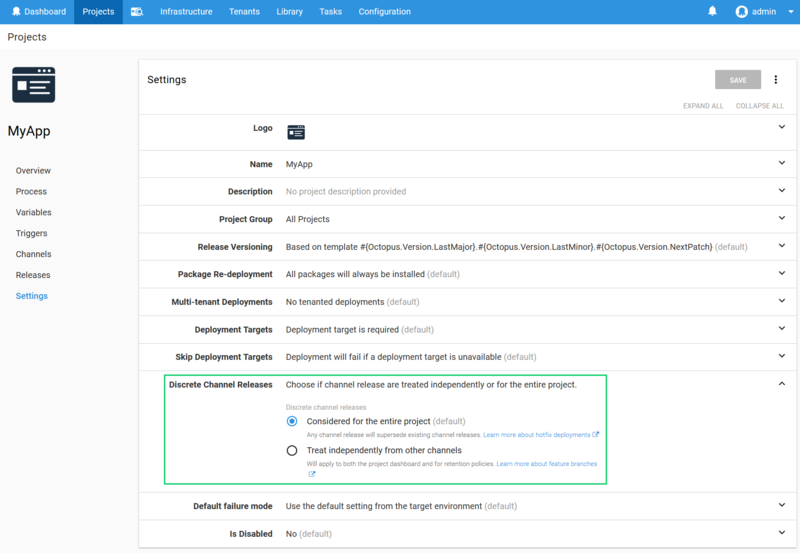 To prevent retention policies for one channel from impacting deployments for another channel, version 3.12.2 introduces the Discrete Channel Releases flag at under Deployment Target settings on the Project ➜ Process page. 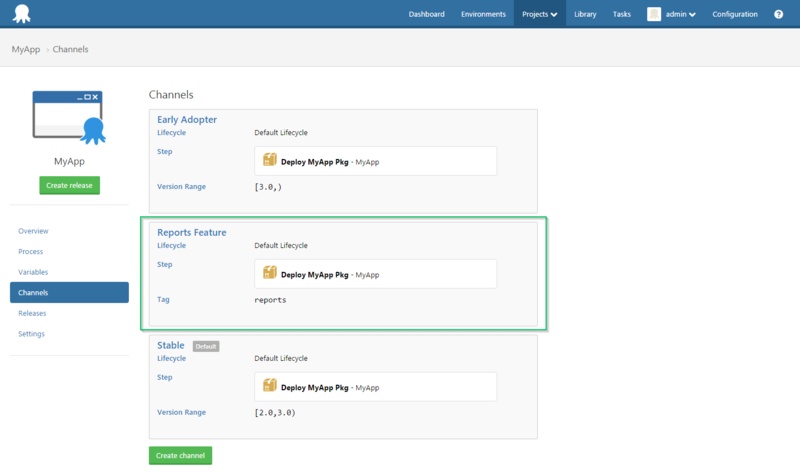 Enabling this feature will also ensure that your project overview dashboard correctly shows which releases are current for each environment in each channel. Without this set, the default behavior is for releases across channels to supersede each other (for example, in a hotfix scenario where the 3.2.2-bugfix is expected to override the 3.2.2 release, allowing 3.2.2 to be considered for retention policy cleanup). In this example, packages that start with 2.x go to the "Stable" channel, while packages that start with 3.x go to the "Early Adopter" channel. Branches can be short lived and tend to get merged, and model the way code changes in the system. Channels are often long lived, and model your release process. For example, Google Chrome have four different channels (Stable, Beta, Dev, and Canary). Their channels are designed around user's tolerance for bleeding edge features vs. stability. Underneath, they may have many release branches contributing to those channels. You can read about implementing early-access programs in the Channels Walkthrough. It's important to realize that branches will map to different channels over time. 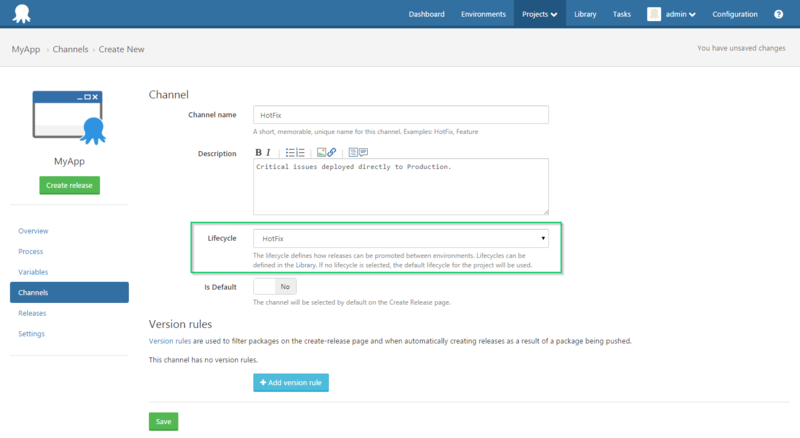 For example, right now, packages from the release/v2 branch might map to your "Stable" channel in Octopus, while packages from release/v3 go to your "Early Adopter" channel. Eventually, release/v3 will become more and more stable, and packages from it will eventually go to your Stable channel, while release/v4 packages will begin to go to your Early Adopter channel. Again, channels make creating releases a little easier here, but users can do feature branching without channels too. We also discuss feature branches in the Channels Walkthrough. Feature branches are usually short lived, and allow developers to work on a new feature in isolation. When the feature is complete, it is merged back to trunk/master. 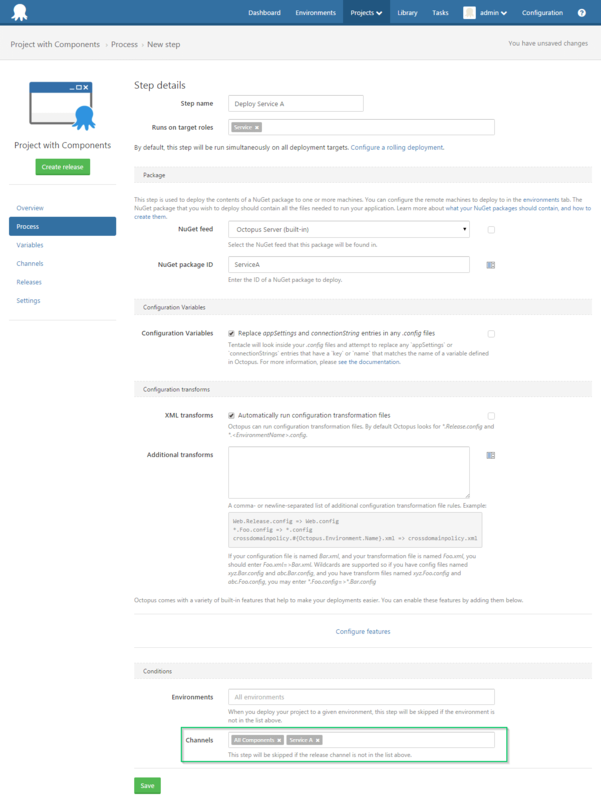 Often, feature branches are not deployed, and so don't need to be mapped in Octopus. If feature branches do need to be deployed, then you can create NuGet packages from them, and then release them with Octopus as per normal. To keep feature branch packages separate from release-ready packages, we recommend using SemVer tags in the NuGet package version. You should be able to configure your build server to generate version numbers based on the feature branch. A final branching strategy that we see is to use a branch per environment that gets deployed to. Code is promoted from one environment to another by merging code between branches. We do not like or recommend this strategy, as it violates the principle of Build your Binaries Once. The code that will eventually run in production may not match 100% the code run during testing. It's easy for a merge to go wrong and result in different code than you expected running in production. Packages have to be rebuilt, and different dependencies might be used. However, on the whole, this isn't a scenario we've set out to support in Octopus, and we don't believe it's a good idea in general. 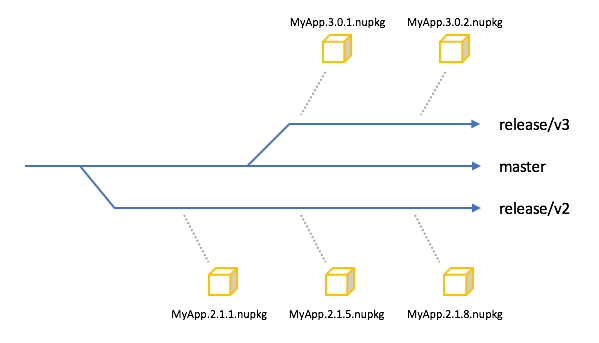 The above section describes common branching strategies and how they map to NuGet packages, releases and channels in Octopus. However, depending on your release process, there may be other things to consider. Below are some issues that often come up in relation to branching and Octopus. Normally in Octopus, a single release for a project is deployed to a single environment at a time - for example, only one release is "currently" in Production. When you have multiple active release branches, or sometimes even feature branches, it might be that you actually have more than one "current" release. The Stable channel is deployed to the same web servers as the Early Adopter channel, but each goes to a different IIS website. The Stable channel and Early Adopter channels go to different web servers. Each feature branch goes to its own virtual directory. In the RFC post, we never mentioned this, but it's something we've since discussed a few times and always assumed it would be part of release channels. That said, I'm considering whether we should ship channels without this feature. The Project Overview could still show different channels easily (since each release belongs to a channel), but the global dashboard might not be able to. We can see if there's a big demand for this feature. This scenario is why we allow scoping steps and variables to a channel; currently everyone clones projects, and it's hard to maintain. Sometimes a new branch might introduce a new component that needs to be deployed, which doesn't exist in the old branch. If you use channels, you can scope deployment steps and variables to channels to support this. For more advanced uses, you may need to clone your project. With Channels you can define which Lifecycle each Channel will use for promoting Releases. We discuss hotfix deployments in the Channels Walkthrough. Hotfixes are a special kind of release branch, but typically have a shorter lifecycle - they may need to go directly to production to fix a critical issue, and might skip certain deployment steps. This scenario often comes up: we have a micro-service architecture with 50 different packages. Sometimes we deploy a few components, sometimes we deploy them all, sometimes just one. The only way to support that currently is with cloning, or skipping steps each deployment which is very tedious. You might have a large project with many components. Sometimes you only need to deploy a single component, while other times you may need to deploy all components together. This can be modeled by creating a channel per component, plus a channel for a release of all components.